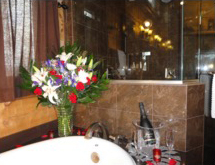 Make your special mountain getaway even more special with one of these Romantic Gift Packages. If you're making online reservations, you can purchase any of these at checkout. Otherwise call our office at 828-321-2010 to order. Must be ordered 72 hours prior to arrival date. Silk Rose Petal Trail from entrance of the cabin to the candle lit bedroom. Must be ordered 72 hours prior to arrival date. An arrangement of fresh cut flowers. An arrangement of fresh cut Red Roses. 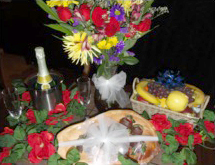 Gourmet chocolates or our handmade chocolate covered strawberries (seasonal) and a basket of fresh fruit. 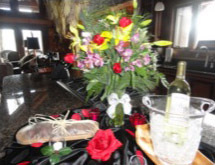 Bottle of your choice of Biltmore Chardonnay, Biltmore Cabernet Sauvignon, Barefoot Bubbly Champagne or Sparkling Grape Juice with commemorative Cherokee Mountain Cabins Wine Glasses. (Please state selection in comments section as you make your reservation). 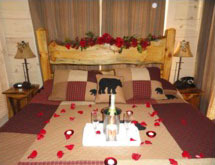 Silk Rose Petal Trail from entrance of the cabin to the candle lit bedroom with 2 Monogrammed Luxurious Robes.